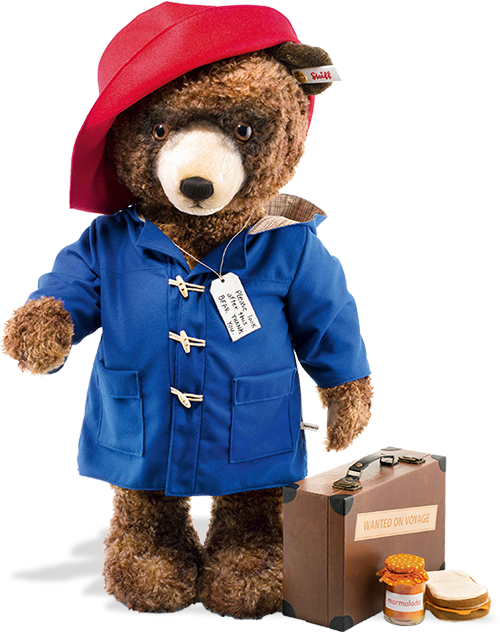 Steiff Paddington (life Size) - Only 350 Pieces Made Worldwide! "Each piece of approximately 106cm (41") tall. MAGNIFICENT"
You can give as a wonderful gift which could be moved down from generation to generation. Just put in a special corner - where he can be loved and adored. Mrs Brown bent down and said - 'You're a very small bear' and PADDINGTON replied saying 'I'm a very rare sort of bear and there aren't many of us left where I come from'. And 'Where is that?' asked Mrs Brown...............'Darkest Peru' said PADDINGTON. The author, Michael Bond, based PADDINGTON Bear on a lonely teddy bear he noticed on a shelf in a London store on Christmas Eve in 1956 which he kindly bought as a present for his wife. The bear inspired Bond to write a story named - 'A Bear Called Paddington' - published on 13th October 1958. Little could he have known then how many people from around the world would come to know, love and adore his small bear from darkest Peru. Today the adventures of PADDINGTON Bear love both young and old. His huge popularity has propelled him on to the big screen making PADDINGTON a famous film star! Here we have an incredible PADDINGTON BEAR designed and made by the worldwide famous company - Steiff Bear. He is approximately 106 cm (42 inches) tall - so he can be placed in your home and adored for ever! Here PADDINGTON is thrilled not only to be life size but larger than life in everyway. He is two -way jointed (his legs) and made from the finest chestnut mohair. He has shiny black and brown eyes and hand stitched mouth and nose - and just look around his eyes and nose and you will see how he has been hand airbrushed. He is wearing his famous blue jacket which has three toggles and two pockets and he has a tag which hangs from his neck which reads 'Please look after this bear. Thank you'. He is wearing his smart red hat - which shows his ear and much sought after Steiff white label. He comes with a suitcase - which says 'wanted on voyage', jar of faux marmalade and a scrumptious looking faux sandwich. Now this is super PADDINGTON BEAR. And only 350 are being made for the whole world - so a highly collectible Steiff bear.